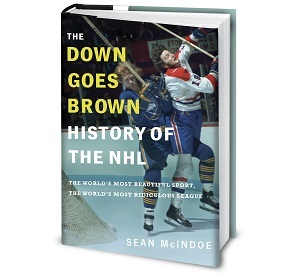 Down Goes Brown: Which teams have the odds for a Cup in the next five years? Part one. Which teams have the odds for a Cup in the next five years? Part one. In the NHL, it is all about the Stanley Cup. Yes, building a champion takes time, and there can be moral victories along the way. Yes, sometimes a great team just never gets over the hump. Yes, there’s a ton of luck involved, way more than any of us want to admit. And yes, because of all that, smart teams (and fans) will learn to trust the big-picture process over one focused on short-term results. That’s all well and good. But eventually, all anybody wants to know is: Did you win the big one? So as we gear up for the 2015-16 season, let’s take a shot at answering a simple question: Which NHL teams have the best odds of winning at least one Stanley Cup in the next five years? On the surface, that sounds like it should be an easy enough exercise. We just take all 30 teams and look at both their current roster and their prospect pipeline. That should tell us just about all we need to know about if and when they’ll be ready to contend. Well, unless they have cap issues. Or financial problems. Or complications in the front office or behind the bench or in the owner’s box or … you know, maybe our simple question turns out not to be so simple after all. But that’s no reason not to try, so here we go. Why five years? It seems like a reasonable window to work with — long enough that today’s rebuilding teams have a shot, but not so long that what’s already an exercise in crystal-ball gazing turns into an outright guessing game. But remember, we’re not exclusively focused on the future here; a Stanley Cup won next season counts every bit as much as one won years down the road, so you’ll see a mix of young and old teams at the top of the list. In fact, as we’ll see, it’s probably true that the absolute worst place to be in the NHL is stuck in the middle — not elite today, but not pushing aggressively enough toward tomorrow. Finally, a little warning before we get started: As we make our way down from no. 30 to no. 1, you’re going to find yourself thinking that the odds for many of these teams seem way too low. But do the math — with five years to cover, we’ve only got a pool of 500 percentage points to work with and 30 teams to spread them out across. If you want to yell at me that Team X is 10 percent too low, make sure you also tell me which team is 10 percent too high. This will be a three-part series. Today, we start from the bottom, with the 10 teams facing the longest odds to capture a Cup. Today’s list features some predictable entries, along with a few that I suspect will be met with objections from the fan bases involved. Let’s start the countdown with no. 30. Inevitably, the fan base of whichever team gets stuck in the 30 spot will scream loudly that they can’t possibly be the worst of the worst. So let’s pause to concede that there’s not all that much separating the bottom half-dozen or so teams that rank in the low single digits. If it would make you feel better to nudge the Devils up a percentage point or two and into a better slot, go right ahead. But the result remains the same: This team is old and not very good, and there’s little in the way of encouraging prospects on the way beyond Pavel Zacha. The Devils have also just begun the transition from the Lou Lamoriello era to whatever it is that comes next. They’ve got a very good GM in Ray Shero driving that, which is good news, because the job ahead is massive. Teams can be rebuilt; it happens all the time. And the Devils do appear to have an elite goaltender, which makes ranking them here a bit risky — if they somehow managed to squeeze into the playoffs, who knows how far a hot Cory Schneider could carry them. But right now, even squeezing into the playoffs seems like a dream for down the road. Today, the team is bad and the cupboard is bare, and there’s no quick fix for that. The Devils are a smart organization that will get back on track, but it will probably take most of our five years for that happen. Are the Hurricanes rebuilding? They finish toward the bottom of the league every season, and they’re amassing young talent, so that would point to a “yes.” But they haven’t moved veteran stars like Eric Staal or Cam Ward yet, so maybe not. New GM Ron Francis has sent mixed signals about where the team is headed, and how much (if any) focus on short-term success that strategy includes. In either case, the Hurricanes have been bad for years (they haven’t been to the playoffs since 2009), and there’s little hope that that will change this season. The future is somewhat brighter, with a solid prospect pipeline that’s heavy on defensemen although short on blue-chip stars. That cupboard will get a boost if the team does move Staal or Ward, both of whom are on the final year of their deals; but remember that Ward may not have any value left and Staal has a no-trade clause. Forget about championships; a path back to the playoffs seems murky at this point. This franchise certainly knows how to make the most of its playoff berths — they’ve missed the postseason in 10 of the past 13 seasons, but won nine rounds in the three years they did make it — so we can’t rule them out entirely. But it’s close. On the surface, this rating seems low for a team coming off a 101-point season. The Canucks are led by two first-ballot Hall of Famers in the Sedin brothers, and they have a star goaltender in Ryan Miller, at least based on name value if not actual performance. You could do worse than trying to chase a Cup with that sort of foundation. But the Canucks aren’t like most 101-point teams. The core is old — in addition to the Sedins and Miller being 35 on opening night, Alexandre Burrows and Radim Vrbata are both 34. After an offseason that could charitably be described as puzzling, the roster seems worse than last season’s, with Kevin Bieksa and Eddie Lack exiting without the team bringing in any immediate help in return. And there’s plenty of evidence that last season’s team just wasn’t as good as its point total would suggest. Add it all up and it’s hard not to look at the current-day Canucks as a team that needs a rebuild but doesn’t know it yet — just about the worst place to be in a salary-cap league. The Canucks’ prospect pipeline isn’t strong, and the work of GM Jim Benning on moves like the Lack trade and the Brandon Sutter acquisition and subsequent signing has been widely panned. And to make matters worse, the Canucks could find it uniquely challenging to embark on a rebuild even if they wanted to, since their two best veterans happen to be twin brothers who’ve always insisted on playing together. Getting good future assets for a player who’s about to turn 35 and carries a $7 million cap hit through 2018 in today’s league is tough; trading two as a package deal might be near impossible. It’s certainly conceivable that this season’s Canucks could come close to a repeat of last season, overachieving on their way to a spot in the playoffs, where anything can happen. But it seems far more likely that they’ll be also-rans this season, the cracks in the foundation will soon become impossible to ignore, and the team will finally decide to hit the reset button and start a multiyear rebuilding project. If so, that doesn’t leave much time in our five-year window. As a Devils fan - nope, you've got us in the right place. We spent too long being mediocre. If we'd been able to re-sign Parise and keep Kovy it'd be completely different but as it is we've got a great goaltender and a bunch of players who look great when compared to the rest of the team and middling to bad if placed on any other team.